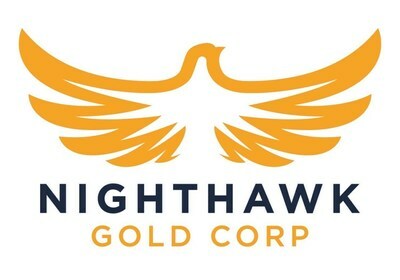 TORONTO, April 3, 2019 /CNW/ - Nighthawk Gold Corp. ("Nighthawk" or the "Company") (TSX: NHK; OTCQX: MIMZF) is pleased to announce commencement of its 2019 drilling program with three drills active on the Colomac Gold Project ("Colomac"), centrally located within the Indin Lake Gold Property (899km2 land package), Northwest Territories, Canada. The Company previously announced a budget of $10 million which includes a minimum 25,000 metres of drilling (split between Colomac and select priority gold targets within its extensive regional land package), as well as the continuation of the regional mapping and prospecting program. The drilling costs are estimated on the higher-end at approximately $9 million (as the program progresses Nighthawk anticipates a lower cost per metre than budgeted), and an additional $1 million spend on the regional mapping and prospecting program which will continue to assess the land package for new discoveries and move targets up the value chain towards drill-ready status. Program objectives are to continue the expansion of higher-grade mineralization intersected to-date at Colomac and to explore for other new zones of near surface higher grade material within the Colomac area sills, culminating in the delivery of a resource update by early 2020. Regional Prospecting and Mapping – Will commence in early June and will continue to follow-up on historical showings, areas of interest as identified by previous fieldwork, leading to the prioritization of future drill targets. Dr. Michael Byron, President and CEO commented, "We are very pleased to be embarking upon our eighth drilling season at the Indin Lake Gold Property. We've had great success over the years rejuvenating the Colomac deposit into an ever growing, mutli-million-ounce opportunity with a new high-grade storyline and exceptional metallurgy. We are thrilled to continue our work of delivering on the vast potential that the Indin Lake Gold Camp possess, one that we believe will flourish in tandem with Colomac, as we advance our aggressive regional exploration initiatives of geological mapping, prospecting and ground geophysics promoting key targets to drill-ready status in search of new discoveries. We look forward to providing drill results as they become available." The Company has an experienced and dedicated team and is well funded to complete its goals and objectives over the next 12 months. Dr. Michael J. Byron, Ph.D., P.Geo., President & Chief Executive Officer of Nighthawk, who is the "Qualified Person" as defined by NI 43-101 for this project, has reviewed and approved of the technical disclosure contained in this news release. Please refer to NI 43-101 technical report "Technical Report and mineral resource estimate update on the Colomac Property of the Indin Lake Project", dated June 13, 2018, as filed under the company's profile on www.sedar.com. This news release contains "forward-looking information" within the meaning of applicable Canadian securities legislation. Forward-looking information includes, but is not limited to, information with respect to the Company's continued exploration programs (including size and budget) and the ability to advance targets; producing an updated NI 43-101 resource estimate for Colomac, and the timing and results thereof; the ability to raise the necessary capital on acceptable terms in order to conduct exploration programs including mapping, prospecting and drilling activities and identify new targets in future years, as well as any intention to expand these programs in the future). Generally, forward-looking information can be identified by the use of forward-looking terminology such as "plans", "expects", or "does not expect", "is expected", "budget", "scheduled", "estimates", "forecasts", "intends", "anticipates", or "does not anticipate", or "believes" or variations of such words and phrases or state that certain actions, events or results "may", "could", "would", "might", or "will be taken", "occur", or "be achieved".